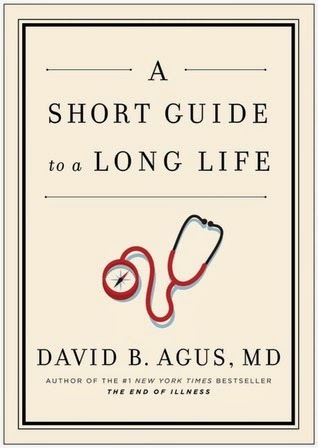 A Short Guide to a Long Life is divided into three sections (What to Do, What to Avoid, and Doctor's Orders) that provide the definitive answers to many common and not-so-common questions: Who should take a baby aspirin daily? Are flu shots safe? What constitutes healthy foods? Why is it important to protect your senses? Are airport scanners hazardous? Dr. Agus will help you develop new patterns of personal health care using inexpensive and widely accessible tools that are based on the latest and most reliable science. Now go live life! The writing is completely straightforward and easy to understand. I think it perfectly captures what the author was trying to convey - medical advice and information for the average citizen. He doesn't go too in-depth, doesn't use complicated medical jargon, and doesn't spend too much time on any one topic. This is a very basic overview of his general health philosophy and he encourages the reader to do further research on any one topic of interest. I think I may have enjoyed this one more in print than on audio. That's not to say it wasn't informative and helpful, or that it was difficult to understand or unpleasant listening. I just think the illustrations included in the print version and the ability to flip through from topic to topic would have enhanced my experience with it. As far as the content was concerned, I found it to be helpful and engaging, written in language that was easily understood and with ideas and recommendations I felt I could easily put into practice in my day to day life to make myself more healthy. I also appreciated that Agus acknowledges that some of his ideas are controversial and that each individual has to decide for him/herself, along with his or her own physicians, what is the best course of action. He really focuses on empowering the individual and on researching health and wellness choices and being proactive in your own medical treatment. No complaints, but no raves either. Standard. I mean, it's straightforward medical information, so there's not much any narrator could have done to blow it out of the park. It was completely fine and that was exactly what was called for in this book. Thank you to Simon and Schuster for providing me with a copy of this to listen to on audio.